How can a person best avoid falling for strange/false teachings? Is any strange teaching alluded to in verse 9? If so, what? Why are there no “new” teachings or revelations? (see verse 8?) What should our response be to someone who says they have a new revelation from God? What is the altar in verse 10? In what way did Jesus die “outside the gate?” What gate? How can we go to Him outside the camp? Why does the author use so much of this figurative language here? What is the city which is to come? How can you seek it? Chapter 13 contains a number of final reminders to the Hebrews. One of these is a warning against false teachings. Verse 8 tells us that Jesus is the same yesterday, today, and forever. Because He is the same, truth is the same. Truth doesn’t change from generation to generation, country to country, or church to church. There will be no new “revelations” from God that contradict any teaching of the Bible. Cults are often built upon some new or strange teaching that is not recognized as taught in the Bible. We should be wary of this. Not everything that sounds good, is. Satan often appears as an angel of light. When in doubt, always turn to God’s Word as the final authority. The second part of verse 9 seems to indicate an area which some cults were emphasizing. That is food. Perhaps they were stressing some ritualistic meal. Based on the context it could be a reference to the Levitical priests eating part of the sacrifice made to God. We don’t really know. But the author makes a point to compare Christ to the sacrifice made on the Day of Atonement. Verse 10 – Altar – Basically this refers to Christ’s sacrifice for us on the cross. This is the “altar” which we come to for the washing away of our sins. The priests who still followed the Old Covenant system could not come and partake of Christ’s sacrifice. Verse 11 – This is a reference to the practice on the Day of Atonement. On that day the priest made a sacrifice for the sins of the people. The blood of the sacrifice was taken into the Holy of Holies and dripped on the Ark of the Covenant. The body of the dead animal was taken outside of the camp and burned, which was symbolic of the sins (which had symbolically been transferred to the animal) of being taken away from the congregation. Verse 12 – Remember that a key theme in the book of Hebrews is that Jesus is superior, specifically superior to the Old Covenant and Law. Jesus was the ultimate sacrifice which the offering on the Day of Atonement foreshadowed. Remember that this sacrifice had to be repeated yearly, but Jesus’ was once and for all. Jesus also offered His own blood. Jesus suffered outside the gate of Jerusalem another symbolic similarity to the sacrificed animal on the Day of Atonement. Verse 13 – The author gives a call to action for us (an application). Because of Jesus’ sacrifice for us, we should draw near to Him. He uses the terminology “let us go out to Him outside the camp.” This is figurative language in keeping with the context. What exactly this “camp” refers to is not clear. It could be that the camp is popular opinion or what the majority is doing, meaning we have to be willing to give up the ideas and opinions of the world to follow Jesus. That fits in with the second part which says “bearing His reproach.” To follow Christ we have to be willing to suffer for Him. Just being associated with Him could make us a target of persecution and scorn. Are you willing to face this for Christ? Is there a limit to how much you are willing to face? Verse 14 – None of the greatest cities in world history have kept their splendor and power forever. Babylon, Nineveh, Jerusalem, Rome, XiAn, etc. all rise and fall. Man-made things are always temporary. God’s kingdom is eternal. A long time ago I realized that I can spend my life building one of two things, God’s kingdom or mine. I can spend my time getting more materials, money, security, and position, which will all one day fade away. Or I can spend my time serving God and doing whatever I can to help expand His kingdom. I can’t say that on a day to day basis I always choose the activities that build His kingdom and not mine, but this is my goal and the direction I want my life to head. Are you building His kingdom or yours? Is you heart seeking something on earth or God? When should we be praising God? When we think of sharing we often think of it in terms of children sharing. How about adults? Why does verse 16 say we should share with others? What leaders do you think are referenced in verse 17? What insight does this give us about what Christian leaders should be doing? How should this verse motivate leaders? How should it motivate Christians who are not leaders? What kind of actions give a leader joy? Grief? What else should we do for leaders (verse 18)? In light of all the things we have learned in the book of Hebrews about Christ and what He has done for us, what should we do? We should praise Him. I really like the use of the word “continually” here. When we think of praising God maybe we think of the weekly “praise and worship” session at church. There is so much more to praising God than this. Besides, if we don’t praise God privately then how can we truly praise Him publicly? When we are walking outside under the moonlight, we can praise God for His creation. When we are laughing and playing with our kids, we can thank and praise God for their unique personalities and the blessings they bring. When we are enjoying a nice meal, we can praise God for giving us taste buds and for His provision. When we study the Word, we can praise God for His character and plan for the world and us. The list goes on and on. The point is that we should have an attitude that is always thankful to God for the big and little joys in this life. We should be coming near to God all the time in gratitude, not just once a week, thanking Him for each new day, for each fresh breath that we are blessed with. Sacrifice of praise – A sacrifice is something which is pleasing to God. A real sacrifice normally costs us something. Remember that David said he wouldn’t make a sacrifice to God that cost Him nothing. If we are truly offering a sacrifice of praise to God, we must be willing to give up something for Him. What will give up for Him? Money? Time? How about “face”? Our own glory? Our own desires and plans? Our “rights”? Fruit of the lips – Praise comes from the heart, but this verse makes it clear that we should verbally put words to it. The process of putting words to the thoughts in our heart clarifies in our minds exactly what we are praising God for. Give thanks to His name – This phrase shows that thanksgiving and praise go hand in hand. Verse 16 – This verse is another practical application. Sharing is something we think kids should do. But in reality all believers should be sharing. What can we share with others? Verses 18-19 – Pray for the leaders. The church would be a much better place if the flock prayed for their leaders (even when disagreeing with them) instead of complaining about them. Support and encourage them in their service. Show hospitality to them. Don’t think about what you can get, but what you can give. What genre of Scripture is verse 20-21? How does He equip us? What final reminders did the writer give? Why do you think he said this letter was brief? Briefly go over closing benediction phrase by phrase. Closing Prayer for book of Hebrews. Go around the table and give each person one verse to read aloud and pray over. Application: Reflect on what you have learned in the book of Hebrews and if you have grown. Have you been applying the principles you have learned? Which areas do you still need work on? Visit more of our hundreds of inductive Bible studies. 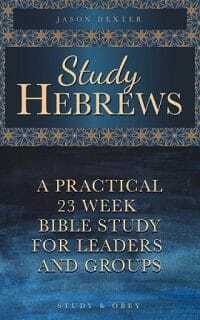 For another in-depth Bible study of Hebrews visit IntothyWord.